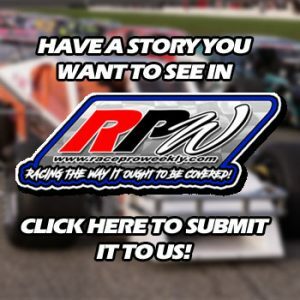 Column By: PHIL SMITH / RPW – WESTERLY, RI – The NASCAR Whelen Modified Tour Series traveled to the Riverhead Raceway on Long Island. After enduring adverse weather conditions for hours the competitors, raceway staff, NASCAR and many loyal fans hung in there. The event took the green flag at 9:41pm. 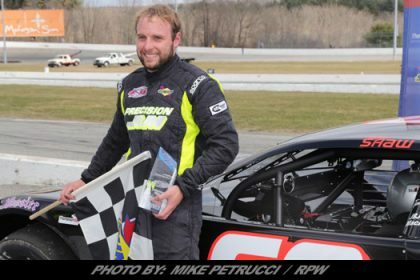 Justin Bonsignore took the lead from Timmy Solomito on lap 133 and went on to score his sixth career NASCAR Whelen Modified Tour win at his home track, sweeping the two races at the New York oval in 2018. The victory was the seventh in the first 13 races of the season and his 19th career in Whelen Modified Tour competition. After qualifying was rained out, Bonsignore started from the outside pole position after the field was set by practice speeds. Bonsignore didn’t have the car to beat in the early laps as polesitter Doug Coby was at the point for the first 64 laps. 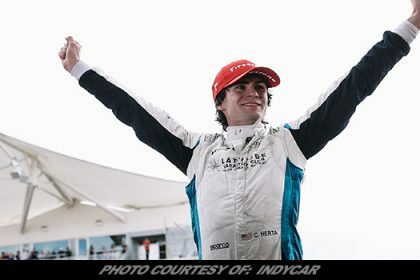 But, when Coby spun from the lead off turn two on lap 65, Bonsignore found himself in the middle of a battle with fellow hometown favorite Timmy Solomito for the win. After chasing the back bumper of Solomito’s No. 16 Starrett Tools Ford, Bonsignore made his move on lap 133 and was not going to be denied. A final caution flag on lap 152 gave Solomito one last chance, and he was able to lead the field across the line on lap 159. But, just one lap later, Solomito slid back and Bonsignore took control. Chase Dowling, who is still looking for his first career Whelen Modified Tour win, scored his eighth podium finish in 54 career starts as he finished third. Coby, who spun from the lead early, rallied through the field and finished fourth. Dave Sapienza, who ran as high as third spot before a crash on a restart, came back to finish fifth. John Fortin was sixth, followed by John Beatty, Shawn Solomito, Chris Pasteryak and Rob Summers. There were four caution periods for 29 laps. Eighteen of the original 24 starters were running at the finish. Among those who failed to finish were Gary McDonald who dropped out on lap 160 when he crashed. Melissa Fifield pulled off after 25 laps with ignition problems. Riverhead regular Ken Heagy had rear end problems while Tom Rogers Jr, Matt Swanson and Cory Osland crashed out of the event. The Riverhead event will be telecast by NBC Sports Net on Thursday, Sept 13 at 6:00pm. The NASCAR Whelen Modified Tour will return to the track at New Hampshire Motor Speedway for the inaugural Musket 250 on Saturday, September 22. 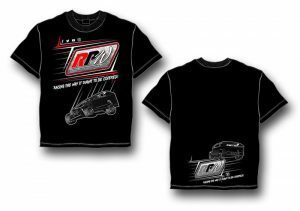 At the Stafford Motor Speedway on Friday night the Street Stock division took center stage with the extra distance R.A.D. Auto Machine Street Stock 30. George Bessette, Jr. took down the extra distance win while other feature winners on the night included Michael Christopher, Jr. winning his second race of the season in the SK Modified® feature, Tom Fearn scored his 12th Late Model win of the year and in the process clinched the track championship, Bryan Narducci made a last lap pass on Marcello Rufrano for the second consecutive week to score his fifth win of the season, and Ryan Fearn won his fourth Limited Late Model feature of the season. In the 40 lap SK Modified feature, Christopher, driving a car driven by his late uncle Ted, cruised to his second feature win of the 2018 season with Woody Pitkat coming home second. Chase Dowling edged out Glen Reen by inches at the line for third with Ron Williams rounding out the top-5. Keith Rocco saw his hopes for a repeat championship all but disappear when his car suffered a left front flat tire on lap 3. Because of the fact that he stopped on the track to bring out the caution he was given a one lap penalty for drawing an intentional yellow flag which placed him 15th at the finish. 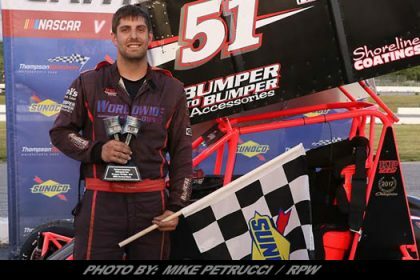 In the SK Lite feature, Bryan Narducci made it two in a row and fifth overall for the season after an almost mirror image performance of the win he scored a week previous. Narducci use the high line in turns 1+2 on the final lap to get a good run going down the backstretch and going into turn 3 he pulled alongside Marcel Rufrano. The two cars drifted up the track in turn 4 with Narducci emerging with the race lead and the ultimate win. Andrew Molleur also got by Rufrano in the final corner to come home second with Rufrano, Mark Bakaj, and Ted Hodgdon rounding out the top-5. 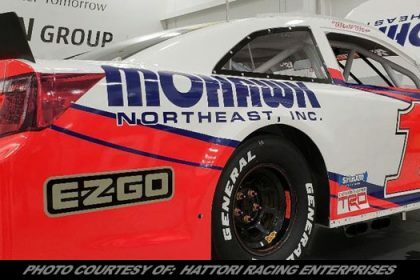 According to Greg Narducci, Bryan’s uncle, With this win he locked up the NASCAR National point standings for Division lll and the NASCAR UNOH YOUTH Achievement Award! Stafford still has 2 races left for their Points, which he’s leading by 26 points. On the Connecticut shoreline at the New London-Waterford Speedbowl they too had their problems with the weather as on and off showers slowed the progress of the racing program. Valient efforts by the track crew made it possible for the races to be run. Andrew Molleur held off Keith Caruso and John O’Sullivan to claim a win in the Bubby Brouwer Memorial, worth more than $1,500. The race was sponsored by Race Choice. There were several other amazing accomplishments Saturday. Doug Curry whirled past Charles Canfield on the final lap to win the 25-lap Mini Stock feature. Jason Palmer thundered around Anthony Flannery on the last lap to capture the 30-lap Late Model race, Mike Blaskey and Peter Bennett continued their duel in the 25-lap Legends feature. Blaskey was able to take down the win by just 0.040 seconds and Kyle James started eighth, blistered through the field in just 23 laps to win the 40-lap SK Modified feature. Jason Chicolas opened up a big early lead and held off Al Stone down the stretch to collect his third Sportsman win of the season. 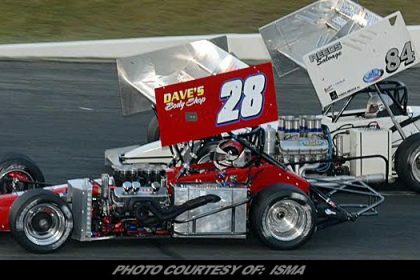 The spotlight, however, was on Molleur who was able to win the most lucrative SK Lite race in Speedbowl history. Paul French led the first seven laps and then Brett Gonyaw took over the lead, Molleur, however, was sifting his way through the field and moved into second by lap 20. After a caution came out midway through the race, Molleur was able to rocket past Gonyaw to take the lead with 22 laps to go. James started eighth in the SK feature but he didn’t stay there for very long. It took him 23 laps to take the lead from Todd Owen en route to his seventh win of the season. James did most of his passing on the outside as he sizzled his way into the lead. Owen was second and Molleur was third. James was able to increase his point lead to 16 over Rob Janovic Jr. The Valenti Modified Racing Series ran on Saturday night at the Beech Ridge Speedway in Scarborough, ME. That event ran head to head with an open competition event at the Claremont Speedway in Claremont, NH also on Saturday night. Due to the conflict, both tracks suffered poor car counts. Beech Ridge had 18 cars while Claremont had 13. At Beech Ridge, 16-year old Sammy Rameau, of Westminster, MA, started ninth is an 18-car field, passed race leader Andy Shaw, of Center Conway, NH, on lap-43, and went on to his second career win in Valenti Modified Racing Series action. Anthony Nocella, who started 13th, moved into second with 15-laps remaining but Rameau hung on to the top spot, to post the win. Richard Savary, who started 18th, finished third, followed Tony Ricci fourth, and Cameron Sontag.Rounding out the top ten were, Woody Pitkat, Andy Shaw, Jacob Perry, T.J. Bleau, and Mike Willis Jr. The Thompson Motorsports Park Speedway returned to action on Sunday with a full program of racing on the 5/8 mile oval. The racing program included Sunoco (SK type) Modifieds (2-20 lap races, 1-10 lap sprint), Late Model (25laps), LTD Sportsman (20laps) and Mini Stock (15laps). The first segment for the Sunoco Modifieds put drivers in an inverted order based on championship points with the lowest driver in points starting on the pole and the driver on top of the standings starting in last. 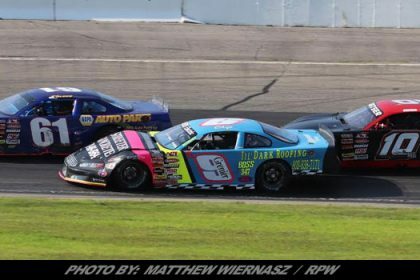 Points leader Keith Rocco quickly moved his way into the top five in the opening laps of the first segment while Marcello Rufrano, Kyle James and Joey Gada held down the top three for the first half of the segment with Woody Pitkat and Rocco in tow. Pitkat would work his way up to second by lap 16 but couldn’t find enough to get past Marcello Rufrano who took the first segment easily. The win was Rufrano’s first career victory in the Sunoco Modified which had the young driver speechless in victory lane. The second segment inverted the finishing order of lead lap cars from segment one and quickly saw one of the best in the business take the lead early as Todd Owen quickly worked his way to the front where he remained for the first half of the race with Kyle James on his tail in second and Keith Rocco settled in third. James closed Owen’s lead to around a car length with five laps. James made one final push in the final corner of the final lap using a lapped car as a pick but Owen managed to score the victory by a nose. 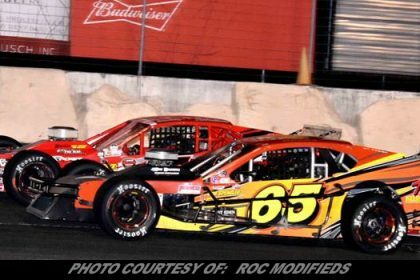 After the two points paying races Keith Rocco takes a comfortable lead into the World Series weekend in October. The reigning champ is looking to win his third division title in a row. When the accrued points for the 20/20 shootout were tallied the final 10-lap segment saw Kyle James as the man to beat for the overall crown with five points while Marcello Rufrano entered the final segment with seven points and Keith Rocco and Todd Owen had an accumulated eight points. The driver with the lowest points total accrued after the final segment was to be crowned the 20/20 Sprint champion. 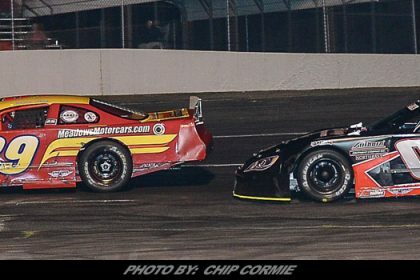 Todd Owens and Keith Rocco started the race up front based on their speeds from segment one while Kyle James settled in fourth for the opening laps. Those positions put Owen and James in a tie for least points accrued and they stayed that way through the final lap. Since the two drivers were tied at the end of the race Todd Owen was awarded the overall victory for the second year in a row for finishing higher that Kyle James in segment three. In other action at Thompson, Shawn Monahan all but wrapped up his second consecutive championship in the division with his fourth win of the season, Tom Carey III won the Late Model event and. Wayne Burroughs scored his fourth victory in the Mini Stocks. On the speedway stock market scene this week, two of the three speedway stocks were up at the end of the four day session. Dover Entertainment went up 0.06 to 2.11 and the International Speedway Corporation went up 0.05 to 44.20. NASCAR cup sponsor Monster Beverage dropped 0.55 to 60.34 and NASCAR fuel supplier Sunoco (Energy Transfer) dropped 1.30 to 22.25 while NASCAR tire supplier Goodyear went up 1.03 to 23.72. The car manufacturers were all negative for the week. Ford dropped 0.20 to 9.28, General Motors dropped 2.13 to 35.92 and Toyota dropped 4.78 to 119.30. In the home improvement sector, Home Depot went up 5.47 to 206.24 and Lowes went up 0.85 to 109.60. In the area of NASCAR big team sponsors stocks, Black and Decker Stanley Tools dropped 1.33 to 139.20 and Dow-Dupont dropped 0.13 to 70.00 while McDonalds went up 1.67 to 163.90, Coca-Cola went up 9.30 to 178.86, Target went up 1.24 to 88.74 and Fedex went up 2.44 to 245.99.